It’s SUMMER! Woohoo! My toes are starting to lose the winter mildew that’s so common in the rainy Pacific Northwest…and earlier than usual since it’s been so warm! That inspired me to get out my Lawn Fawn Life is Good set to color up some sand castles. I may not get a real beach vacation but I’ll take a virtual one! 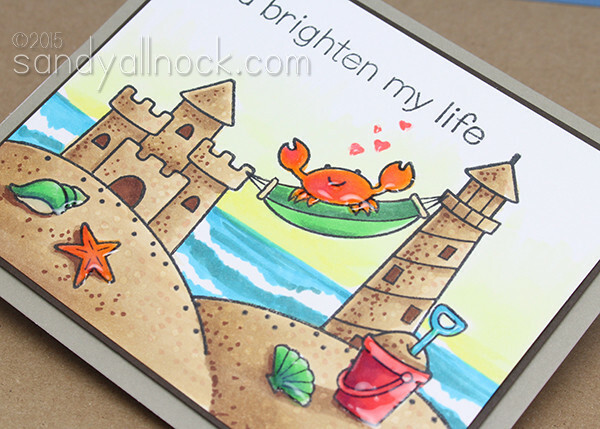 For this card I did some fun little masking first – I stamped the sand dunes and put the castle and lighthouse behind them. Enjoy the video below or click HERE watch it in HD on YouTube! The crabbie in the hammock is totally my favorite part of the card! His little glossy shine along with the shells – they just take the card up a notch! Wow! Love to watch you bring a picture to life!! Love the music you chose also!! Reminds me of Manhattan Transfer. love this video….you are amazing. I love how to draw the waves and horizon with sunshine in the background. The video showing the copic colors clearly is AWESOME!!!! You rock Sandy! 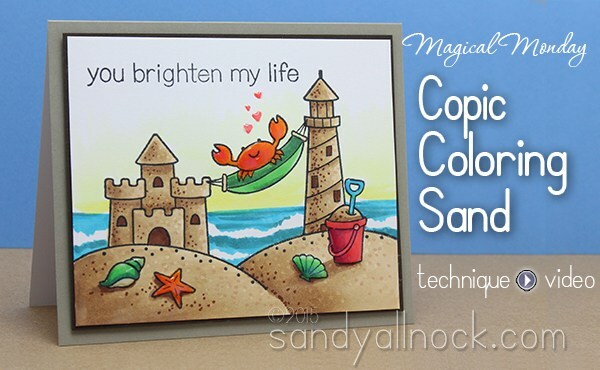 A very nice beach themed card Sandy. I could watch you color all day, your make it look so easy. Thanks for sharing. Wonderful card! What are the original body copics? Makes me look forward to the beach. Super cute and I love how you did the water/waves. What a cute card, love it. So glad I found your blog, I just love watching your videos on coloring with watercolors and various other paints. Thank you. As always, it’s your masterful use of light and shadow that take this card to an entirely different level. The sand would be completely flat with a couple of blobs scattered here and there if I colored it! I am always able to learn something every time you share a new creation. Thank you so much for your kindness in sharing your work.